Hundreds of U.S. troops are said to be making their way to America’s southern border to assist the National Guard and DHS aiming to stop a migrant caravan making its way from Honduras. According to a U.S. official, 800 soldiers are being sent to offer “logistical support”. In response to president Trump’s threat to send the military to the border, Defense Secretary James Mattis could order the deployment as soon as today, Fox News reports. The official said roughly 800 soldiers will be sent to the area to offer “logistical support,” including providing tents and vehicles. It’s not immediately clear which units are being tasked with the mission as details are still being finalized. Thursday morning, president Donald Trump took to twitter calling the caravan a “National Emergency” requiring military support to stop it. The National Guard, assisting Homeland Security, currently has 2,100 troops on the southern border. 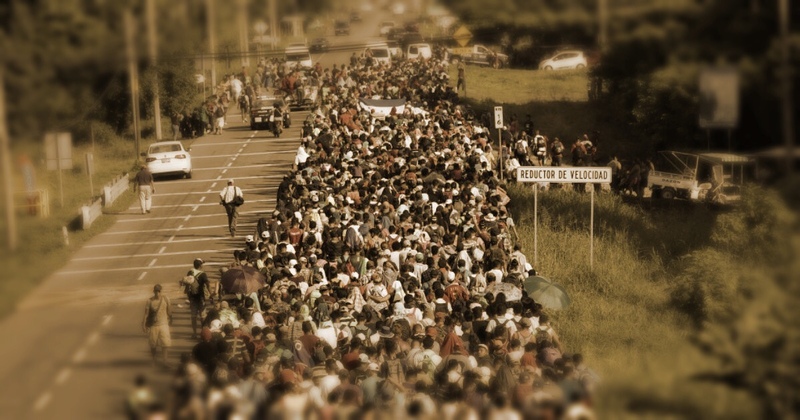 The caravan of around 7,000 migrants is still 1,000 or more miles away from the closest entry point into the United States. Many are suffering exhaustion and other health issues. The actual number of migrants with the caravan is not known as some are turning back to their homelands while others are joining along the way. Sickness, fear and harassment are whittling down the caravan, CNBC reports. President Trump continues to call for a border wall to help combat invasions such as the caravan heading this way. However, it seams to have less appeal now that republicans are trying to fund it through taxpayers instead of making Mexico pay for it as promised. Though mainstream media outlets such as CNBC paints a picture of hundreds of migrants suffering trying to make their way to America for a better life, there is much more at stake. The safety of this nation. As Sara Carter points out, there are people joining up with the caravan from several terrorist countries including members of the MS 13 gang. It’s hard to find fault with Trump’s decision to put our military on the border, it is after all where they belong. Our troops are spread out throughout the world fighting battles for rich globalist which have nothing to do with out freedom. The border is where they belong, protecting us from real threats. Contributed by L.Steele of AmericaUncensored.net, where this article was originally published.